By Sam Smith | 4.14.2015 | 10:30 a.m. It wasn’t how the Bulls hoped it would be eight years ago when they drafted Derrick Rose and with a future league Most Valuable Player were soon on the verge of the NBA Finals and perhaps another, at least, mini-dynasty. But it officially ended Wednesday after a 115-105 victory over the Philadelphia 76ers that gave the Bulls a 42-40 record, but left them out of the playoffs for the first time in eight years. 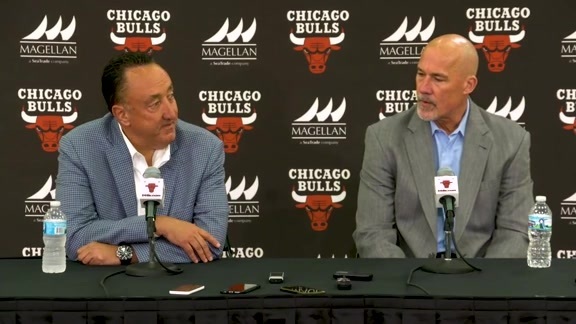 Bulls executives John Paxson and Gar Forman, effectively, confirmed in a post game press conference that this Bulls group once with so much hope and promise failed in its final run, and it’s time for major changes. 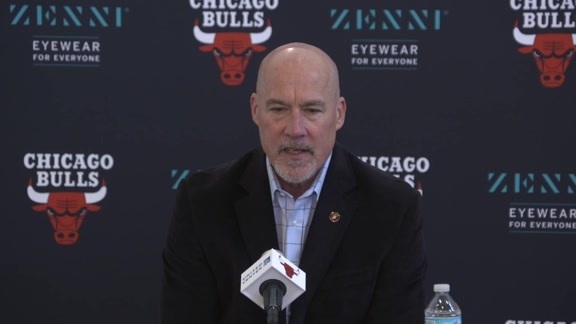 “This roster we brought back, we thought they had one more shot to make a real positive run in the Eastern Conference,” said Bulls Executive Vice President of Basketball Operations John Paxson.”It obviously didn’t play out that way. And that’s where our biggest disappointment comes from. Paxson and Forman, speaking for about 30 minutes, didn’t elaborate or identify any specific changes. The Bulls now will get at least one lottery pick. Joakim Noah and Pau Gasol will be free agents, so they Bulls don’t know even if they’d be interested in a return. But Paxson made clear anyone on the roster could be traded, that there are no untouchables. Paxson said he considered Michael Jordan the only untouchable in trade player. Paxson also said there have been no discussions regarding any management or coaching changes and a report that Forman’s job was in jeopardy was erroneous. Paxson said coach Fred Hoiberg is part of the answer going forward and they believe his future is bright, though Paxson said Hoiberg has to improve and be more demanding. 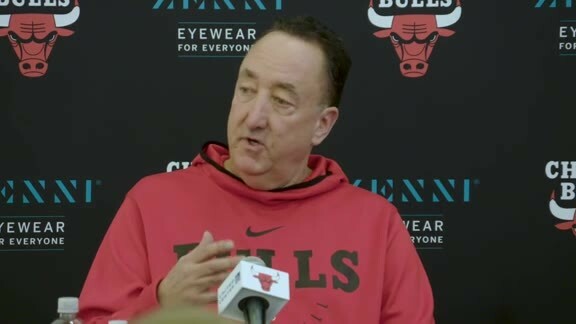 There needs to be less talking about leadership, a reference to Jimmy Butler frequently saying he’s the team’s new leader, and that players need to show leadership rather than talk about it. The style of play has to evolve along with what the rest of the NBA has done for a quicker pace and more shooting, the open style game Hoiberg has emphasized. The team splintered and didn’t seem to show support for one another. Paxson referenced an incident when Blake Griffin took down Taj Gibson in a dirty, physical play and none of the Bulls players backed up Gibson. Paxson reiterated his disappointment in the team’s lack of “collective fight and toughness to fight through adversity. And so ends this era of Bulls basketball, one that began so brightly with Rose’s ascendance and then turned the afternoon four years ago when Rose suffered a torn ACL and the Bulls have since been unable to escape the shadow of misfortune. It’s obviously difficult to make major personal changes without reverting to an early 2000s Bulls model of a complete rebuild with young players. It failed badly for the Bulls then and it’s doubtful they attempt anything similar again. The NBA’s salary cap will increase tens of millions of dollars in each of the next two summers. So the opportunity will be there to add veteran players. Plus, the Bulls have a fairly young roster with Nikola Mirotic, Bobby Portis, Tony Snell, Doug McDermott and recent arrivals who gave done well, like Cristiano Felicio and Justin Holiday, the latter with a career high 29 points in the Wednesday victory over the 76ers. Rose has one year left on his contract as the team’s highest paid player at $21.3 million. Given his injury history, though he played his most games this season in four years, it’s unlikely teams would be interested. Butler has the most value as the team’s leading scorer with a contract through 2019-20 that isn’t excessive in today’s new economic terms. Taj Gibson and Mike Dunleavy both have one fully guaranteed year left on their contracts. Plus, the value of players is diminished when a team does poorer than expected, like the Bulls this season. Paxson on coaching: “After last season, we made an organization decision to go in a different direction with our coach. And we hired Fred. We’re in this with Fred. I think the last few days Fred has an opportunity to express some things that are honest and candid about what he needs to do better. It’s our responsibility to help him along that way. And that’s looking at everything we do from top to bottom.